Cover art for Star Wars: Attack Squadrons. Star Wars: Attack Squadrons was a canceled a free-to-play online game. 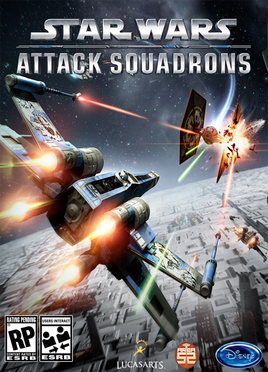 Star Wars: Attack Squadrons was announced by Disney Interactive on December 17, 2013, and closed beta began on January 14, 2014. Developed by Area 52 games. Star War: Attack Squadrons would have had players battle in an open arena while piloting ships from the Rebel Alliance and or the Galactic Empire. The game has been inaccessible since the beta was closed on May 23, 2014. Footage from the open Beta shows that players could only choose between the X-Wing, Y-Wing, and TIE/IN interceptor. Also in the closed Beta footage, it shows that a player would be awarded credits to power up their fighters. Up to sixteen players would be able to play in a single match. On May 23, 2014, the website for Star Wars: Attack Squadrons stated "After much consideration, we have decided to cease development so that we can focus on other Star Wars game experiences. We truly appreciate the time you spent engaging in the beta." No further explanation was given as to why the game was canceled. As Star Wars: Attack Squadrons was only in the beta stage by the time of its release, it is unlikely that the game's code has been made available. Given the short span of the beta trial, it is unlikely that Star Wars: Attack Squadrons will be released. A video showing the gameplay is the only piece of media left. Star Wars: Attack Squadrons open Beta gameplay.